Barska biometric safes provide fast access to your handguns and pistols in the event of a home emergency. 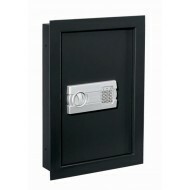 This large Barska safe offers both biometric entry and electronic keypad entry. Also included are two backup keys. Both entry systems work independently of each other so as to make access to the safe easy for you while making it nearly impossible for unauthorized people to get into the safe. 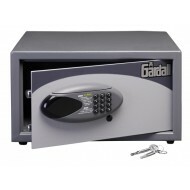 Safe includes a carpeted interior and a removable shelf for storage. Biometric fingerprint safes offer the fastest access to the contents of your safe while keeping your contents extremely secure. This Barska safe holds up 30 fingerprints in its storage. Only let people in who you want and keep everyone else out. Powered on 4-AA batteries, backup emergency keys are included. Solid steel locking bolts keeps this safe secure. Save over 50% off MSRP ($406.25) when you buy from GunSafeStore.com! 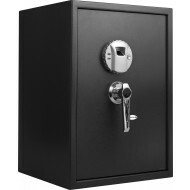 This is a security safe for small valuables such as keys, credit cards, passports and jewelry. The GH5E is easy to access. You may chose to use this in your home but it can also be adapted for dorms and hotels. If anyone enters three bad codes will put the lock into lockout preventing them from gaining access to what's inside. Not only that, but the four pre-drilled holes provide added secuity by preventing would-be thieves from carrying the safe away. Please note this safe is meant for hotels. It has a special pushbutton lock mechanism where the code is set by the user for each opening. 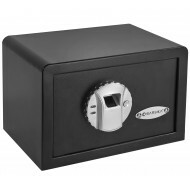 The safe can also be unlocked by the credit card like mechanism and/or backup key. 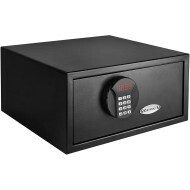 This large Barska biometric safe provides the fastest access to your pistols and valuables. Only authorized fingerprints can access this safe! 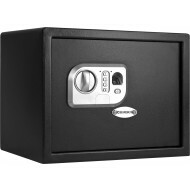 The safe holds up to 120 fingerprints in its memory. It is easy to program a fingerprint in and easy to remove one. The biometric lock operates on standard 4 AA batteries. You will never be locked out of your safe because the batteries can be changed from the outside. 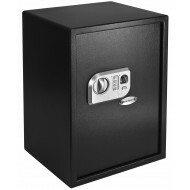 This is an excellent security safe for any valuables. The safe has three dead bolts and solid steel construction. 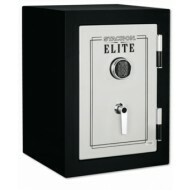 This is a biometric safe but like many biometric safe it gives you other options. Once you see how fast and easy the fingerprint recognition is, you will probably prefer that lock. However, you could let another user use the simple key pad lock and have you both know the code. Stack-on has chosen to give you a third option which is a key overide.The safe comes with a removable shelf and the interior is also lined with a protective fabric. 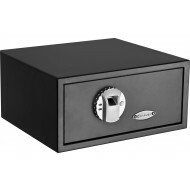 This is an attractive black safe with chrome accents. This is a small handgun safe designed for instant access. You can mute the beep that comes with entry of your fingerprint if you are concerned about a night-time intruder. The AA batteries can be changed from the outside but for you convenience two back up keys are included. 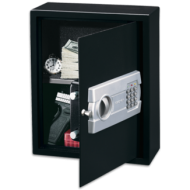 This handgunsafe has earned the approval of the California Department of Justice for secure storage of firearms. There are 2 solid steel live locking bolts and pre-drilled holes that allow the handgun safe to be mounted in a drawer, on a shelf or counter top.